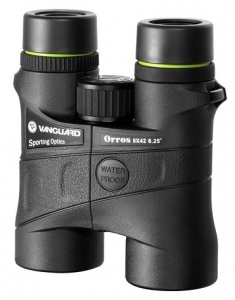 Vanguard Orros 8x42 binoculars are trusted, go-to optics for any kind of outdoor adventure. Whether you’re fishing, hiking, hunting or cheering at a sporting event, Orros provides a crisp, high resolution image. BaK4 roof prisms and multi-coated lenses provide great light transmission with impressive brightness. Compact and lightweight, Vanguard Orros 8x42 binoculars are designed to be use for hours without tire. O-ring sealed, they’re 100-percent waterproof and fogproof so they’ll never let you down in challenging weather or if they slip overboard. Textured rubber armor provides shock resistance and a comfortable, solid grip you can rely on even in slippery conditions. The large focus adjustment wheel enables you to make adjustments easily while wearing gloves.